This Beautiful Antique Victorian window IS TRULY A JOY TO BEHOLD, it has outlived the original frame, and been placed in a a substantial pine frame for shipping & display purposes. The glass has no chips or scratches and the leading is good. 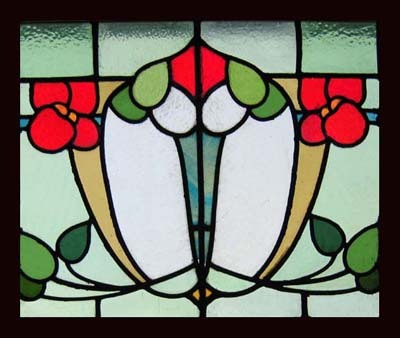 The depth of colour in glass used in this window has been obtained using methods which are no longer allowed Consequently glass as beautiful as this may never be made again. This is a striking work of art containing some very rare and beautiful glass, Removed from a property in Lancashire around the 1900 mark. LEAFY GREENS, RED, & AQUA . This old heavy glass picks up and softly diffuses the colour of the light falling upon it, The frame measures 24 3/4"W x 20 3/4"H The glass is 22" x 18" Shipping and packing for USA would cost $149. You can buy this now on credit card using the secure server paypal or woldpay link below the photograph or e-mail sales click here to arrange payment by personal check ,money order or bank transfer.